Anyone who has tried their hand at basketball knows that shooting a hoop is not as simple as it looks. Try the same while sitting in a chair and you will develop a respect like no other for the differently-abled who play the sport. Much like the group of corporates and sports coaches did, when they participated in exhibition wheelchair basketball matches organised by Wheelchair Basketball Federation of India (WBFI). The countrya��s first, the national-level federation was registered this October by YWTC Charitable Trust, started by Madhavi Latha in 2011.
a�?Being a differently-abled person myself, I know how parents tend to be protective of such children. But the purpose of the YWTC and WBFI is to show these children that they too can take part in physical activities,a�? says Latha, 44, who was 38 when she took up sports for the first time. a�?It started with a hydro-therapy session, after which I learnt swimming and decided to try other sports,a�? says the paralympics swimming gold medalist in 2011. Since last December, YWTC has partnered with Choice International, London, to conduct seminars and coaching camps in wheelchair basketball. In addition to benefiting the differently-abled, these camps are also open to coaches and other basketball players. a�?We cannot forever depend on coaches from abroad,a�? Latha reasons, adding that the federation will be holding their first workshops outside Tamil Nadu, this December, in Bangalore, Trivandrum, Pune and New Delhi, besides Chennai. The bigger picture that the WBFI is looking at involves each state having its own association and club (like the Chennai Eagles, here), thereby enabling more competitions and tournaments on a national scale. a�?Anyone interested in starting a club or association in their state can approach us and we will guide them,a�? says Latha, who is also the associate vice president at Scope International, Chennai. They handle back end operations for Standard Chartered Bank. 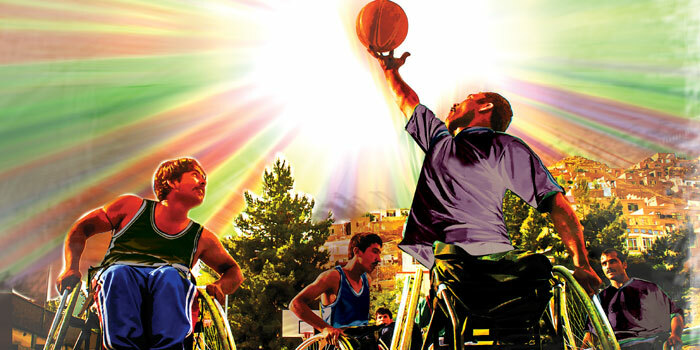 Chennaia��s wheelchair basketball club, Chennai Eagles, is a 20-players strong, with members from different walks of life (students, corporate employees, etc) and as young as 18 years taking up the sport. Many of these players are also swimmers and are currently practising for the paralympics set to take place in November. a�?Our swimming classes are held at the Velachery swimming pool, and the basketball sessions at Jawaharlal Indoor Stadium,a�? Latha says, adding that they encourage mixed games with the ladies in the club also participating.